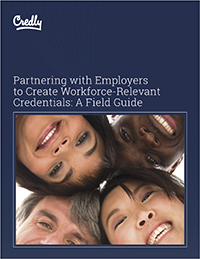 THIS FIELD GUIDE PROVIDES strategies to help your higher education institution develop and launch workforce-relevant digital credentials that are responsive to local employers and the regional economy. Education providers that follow the advice embedded in this field guide will empower their students, employees, members, and stakeholders to successfully navigate the modern labor market with verifiable knowledge and skills. Fill in your information below to download the free Field Guide.